This nightstand offers stylish bedside storage. Two drawers offer simple storage for bedside essentials, while metal brackets provide industrial accents. 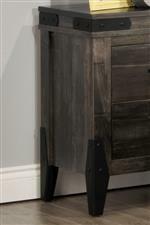 The Chattanooga 2 Drawer Night Stand with Metal Brackets by Handstone at Jordan's Home Furnishings in the New Minas, Halifax, and Canning, Nova Scotia area. Product availability may vary. Contact us for the most current availability on this product. Capture the warmth and character of rustic style with the Chattanooga bedroom collection. 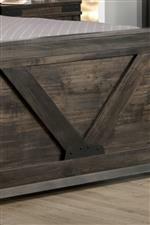 Crafted for life from solid woods with plank detailing, Chattanooga has a distinct farmhouse feel. Metal brackets with rivets add industrial appeal to each piece, while light distressing creates a naturally aged appearance. Though rustic in style, the bedroom collection offers storage to suit your modern needs, with tons of drawer storage and options that include built-in power management. Built to order, and made in North America, you can choose from a variety of wood types, finishes, and hardware options to create the perfect look for your style and bedroom. The Chattanooga collection is a great option if you are looking for Casual furniture in the New Minas, Halifax, and Canning, Nova Scotia area. Browse other items in the Chattanooga collection from Jordan's Home Furnishings in the New Minas, Halifax, and Canning, Nova Scotia area.